Key difference: Tablets are a cross between smartphones and laptops, have a bigger screen than smartphones and provide a better multimedia experience. Smartphones are mobiles that have capabilities like mini handheld computers. A little while back we only used mobiles. The latest trends were smartphones, such as an iPhone or a Blackberry. Then, Apple launched the iPad, a new device that led to the rise of tablets. Tablets and smartphones have a number of functions that overlap, but still each has its own set of distinct features that have given rise to the popularity of each device. Tablets and smartphones both run on an operating system. The two most popular operating systems today are Apple’s iOS and Google’s Android. Tablets and smartphones both run on these systems. Apple’s range of smartphones and tablets include the iPhone and the iPad, respectively. However, there are a number of smartphones and tablets available from various manufacturers that run on Android. The major difference between smartphones and tablets is their connectivity. All smartphone, nowadays, have Wi-Fi and 3G connectivity. This means that they are able to connect to the internet through a Wi-Fi signal, and are able to use the 3G networks to call, send SMS, as well as, send and download data. However, most tablets only have Wi-Fi connectivity. Some tablets do come with both Wi-Fi and 3G connectivity, but they tend to cost more. Tablets are somewhat of a cross between smartphones and laptops. They tend to have a bigger screen than smartphones and are mainly able to do everything that a smartphone can, except making calls and sending SMS. There are also some applications that only run in tablets and not in smartphones. Tablets are built to provide a rich multimedia experience and allow a user to have more computational capabilities. The screens of tablets measure between 7 – 10.5 inches. They look like a large smartphone but with additional capabilities. They also have a large internal memory. 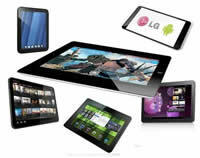 Tablets are mainly used for multimedia, watching videos, reading e-books, and surfing the internet. They feature a full virtual keyboard which is useful for online chatting, social networking and sending emails. Tablets also tend to have dual cameras, which can be used to take pictures, while the front facing camera can be used for video chatting and video calling. Basically, tablets are like a mini computer. They are able to perform most tasks that one uses a laptop for, such as surf the net, take pictures, chat with friends, send and receive emails, as well as use it as an e-Book reader. One can also use a tablet for basic computing functions, watching videos and listening to MP3 songs on the internet. Also, tablets are much more portable and lightweight than most laptops, notebooks or netbooks. The only downside to a tablet is that they can’t be used to make calls. Even on the ones with 3G connectivity, one has to use hands free technology, i.e. a Bluetooth headset, as a tablet is awkward to hold next to the face. Smartphone, on the other hand, fulfill their needs as a phone first. Their primary function is connectivity. They allow the user to make calls, as well as receive and send text messages. However, they also have additional capabilities, and tend to perform more like a personal digital assistant. This is mainly due to their independent operating systems that install and run advanced and complex applications. The advantage that smartphones have on tablets is their portability. Smartphones usually have a screen measuring between 3.5 – 4.3 inches. This suits the need of majority of people that carry their phones in their pockets. They also feature fast processors, large internal memory, user friendly operating systems and a full virtual QWERTY keyboard. Nowadays, most smartphones also act as a smart navigational device with features of GPS, A-GPS, EDGE, and GPRS. Smartphones have the ability to store a large amount of information and media files. In addition, they are able to download and upload files at great speeds on the internet, either via 3G or Wi-Fi. They can be used to surf the net, take pictures, shoot videos, chat live with friends, social networking. They also have twin cameras for video chatting and video calling. Both smartphones and tablets are close to full computers. Due to the introduction of dual core processors and operating systems, they have the ability to do most of everything that desktops and laptops can. Their computing abilities are only restricted by a smaller display and their inability to play a CD or DVD. Smartphones and tablets have a number of similar features that tend to overlap. The major difference between smartphones and tablets is mainly that, smartphones are able to make calls, and are known for their portability. Tablets, on the other hand, are famous for their larger screens and easier web surfing, social networking and video watching capabilities. Great job. It's really useful. Thanks a lot , this article has cleared concept. Very good crystal clear information about the significant difference and similarities.